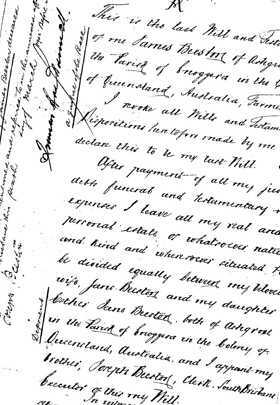 This collection includes transcripts of entries from the index of intestacies, insolvencies, and wills from Queensland. The records pertain to the year range of 1859 to 1900. Residence – several entries include addresses outside Queensland, including interstate addresses and locations outside of Australia. Only that which was included in the notice is recorded in the index to avoid the inclusion of incorrect information. For example, Geraldton is frequently mentioned but it does not refer to Geraldton in Western Australia, rather to the former name of Innisfail and indexing it as Western Australia would have been incorrect. Type – the three major categories are intestacy, insolvency, and will. In addition, there are several entries for lunacy. Notes – may include occupations, relationships, business names, or cross-reference details. Regarding occupations, there is a wide range: from prisoners in Her Majesty's Gaol, to District Court Judges and everything in between. Some of the most commonly listed occupations are storekeepers and publicans who became insolvent far more often than any other. Court – Three Courts existed in Queensland during this time: Southern District (Brisbane), Northern District (Bowen/Townsville), and Central District (Rockhampton). This database is a wonderful genealogy tool, indexing all the notices in the Queensland Government Gazette relating to intestacies, insolvencies and wills (and, where found, other associated notices). Several lunacy notices have also been included, as they were handled by the same office as intestacies and insolvencies. Where individuals have been appointed as executors, but not in an official capacity, they have been indexed. Often accountants or solicitors were appointed to act as trustees or as attorneys for intestate or overseas executors or administrators. Mostly the same name does not occur too frequently and so these have been indexed - for those who have these as ancestors it will give a glimpse of their business. Often the notice in the Gazette includes additional information to that listed in this index, in particular street addresses are sometimes given and it was not always possible to include these in the limited space available. Sometimes the information given in a series of notices appears to be contradictory. We have indexed the details as given in the notices - it is the task then of the researcher to determine which is correct. Intestacy – There are many entries for intestacies for which only a single notice appears, although where there is difficulty in locating the next of kin or heir at law there are additional notices. Additionally, where the estate is to be administered by the Curator of Intestate Estates, there are Notices to Creditors requesting any creditor to come and prove their debts. Insolvency – The term Insolvency has been used to cover insolvency, liquidation, and composition by arrangement. Where indexed, Deeds of Assignment and Deeds of Composition have also been listed under insolvency. In the case of insolvency, many notices appeared in the Gazette, each reflecting various steps in the process. These included notices for the Insolvency Petition, General Meetings of Creditors, Last Examinations, Appointments of Trustee, Declaration of Dividends, Orders to Annul Insolvencies, Applications for Certificate of Discharge, and Certificates of Discharge. Wills – Normally notices pertaining to wills are listed only once although, on occasion, subsequent notices will appear requesting creditors and others with a claim on the estate to present their claims. Some notices refer to Letters of Administration with Will annexed; such notices may have been listed either as will or intestacy depending on the heading of the notice. Lunacy – Various notices regarding the administration of the estate of lunatics appear in this index. Three Courts existed in Queensland during this time: Southern District commenced in 1857 in Brisbane, Northern District was established in 1875 with the court originally located at Bowen and later transferred to Townsville in 1889, and Central District court established at Rockhampton in 1896. Occasional inconsistencies occur. Where the notice does not make it clear which Court was involved, the field has been left blank. There are a few entries occurring in the Queensland Government Gazette from the Supreme Court of New South Wales. In these cases, Sydney has been entered in the Court field.